The blooming of the Balsamleaf Arrowroot -- um, Arrowroot Balsamleaf. Wait a minute, Balsamroot Arrowleaf. 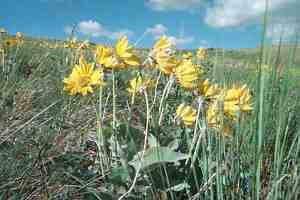 No, Arrowleaf Balsamroot. Well, anyway, this here flower, is a sure sign of spring!